I'm a big proponent of value creation. Anything you do should generate value. Said differently, are you being active or productive. What is it that you need to produce? Be absolutely clear in your head. When it comes to the art of creating something like a novel (while still gainfully employed) you better be effective with every ounce of time that you have. Read, read, read! I read a minimum of two, up to four novels per month. Two are always audio books (auidble.com). I'll pick up a paperback or two during the month. Being able to see how the author structured the narrative, the beats, the pauses, the sentence structure is an important element of my writing. Write, write, write! If you don't write, you can't be a writer (I know, I'm brilliant--no need to send me gifts). When I'm writing, I have a minimum quota of 1,200 words per day. But I'm so competitive (with myself at least) that I do my best to hit the 2,500 mark. As I've posted in the past, I only write after 9 or 10 pm at night for a couple of hours. So I need to be ready, in the right mindset to let the story accelerate out of my fingers. 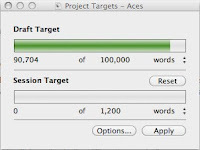 Scrivener, my application of choice, does this simple but critical function with grace. Right brain activity... I never mix right brain (planning, plotting, resolving issues, ...) with left brain activities (writing). In fact, I find that if I don't separate them, my writing slows down and the dialogues start to fall flat. I'm thinking too much while I write, as opposed to let the words come through. During the day, before I start, I think about things that bother me. I have a little Red Moleskine journal that's always with me. I will jot down thoughts, ideas, lines, names of characters, as the day unfolds. Before I start writing, I review what I have there and now the juices are flowing. Blogs and Tweets... It's somewhat cathartic to blog and tweet. It's also inspiring to read the blogs and tweets of others. There are so many generous people out there -- authors, editors, agents-- that want to share. I have been around various industries, and I can't say that this industry is packed with caring and generous people who want to help others. How cool is that. I therefore feel that the least I can do is contribute. I'm a nobody. But if I get signed, then my manuscript is picked up, maybe I'll give some beads of hope and guidance to other aspiring novelists. Currently, I've spent time on revising and developing the approach to resolve the areas of improvement that was raised by my writing coach. I'm really enjoying the process by the way. He has raised such great points, that I can already see will enhance the overall experience from the reader's perspective.